The majority of cellular mRNAs initiate translation! through the recruitment of a multisubunit translation initiation complex termed eIF4F, which consists of the cap-binding protein eIF4E, the RNA helicase eIF4A, and the adaptor protein eIF4G. eIF4G binds poly(A)-binding protein (PABP) to mediate 5' -> 3' communication, probably to promote efficient translation of intact correctly processed mRNAs. eIF4E binding protein 1 (eIF4E-BP1) functions as a translational repressor that limits eIF4E availability and therefore eIF4F complex formation. Viruses have evolved ways of interacting with the host translational machinery to shutoff host gene expression. This global inhibition of cellular protein synthesis serves to ensure maximal viral gene expression and to evade host immune response . All the viruses inducing the shutoff of translation are able to continue to translate at least part of their mRNAs using non-canonical translation: IRES, Ribosome shunting, or VPG initiation. For adenoviridae, polyomaviridae and togaviridae the cellular translation shutoff takes place at the late phase of infection and ensures an optimal production of viral structural proteins. Under stress conditions such as viral infection some cellular translation can continue when the cap-dependent translation initiation is inhibited. Expression of specific cellular proteins seems to occur through cap-independent mechanisms . Family Virus Viral protein Shutoff strategy Viral translation ref. 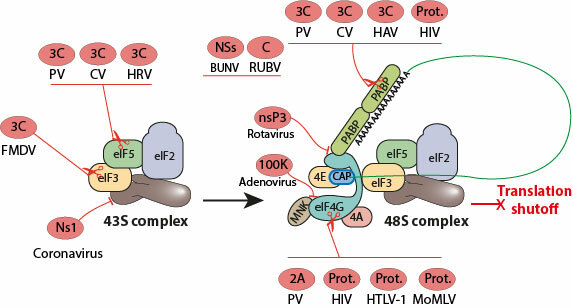 Viral subversion of the host protein synthesis machinery. Bunyamwera orthobunyavirus S-segment untranslated regions mediate poly(A) tail-independent translation. Modulation of enteroviral proteinase cleavage of poly(A)-binding protein (PABP) by conformation and PABP-associated factors. Cleavage of eukaryotic initiation factor eIF5B by enterovirus 3C proteases. de Breyne S, Bonderoff JM, Chumakov KM, Lloyd RE, Hellen CU. Proteolysis of human eukaryotic translation initiation factor eIF4GII, but not eIF4GI, coincides with the shutoff of host protein synthesis after poliovirus infection. Proc Natl Acad Sci U S A. 1998 Sep 15;95(19):11089-94. Mapping of functional domains in eukaryotic protein synthesis initiation factor 4G (eIF4G) with picornaviral proteases. Implications for cap-dependent and cap-independent translational initiation. J Biol Chem. 1995 Sep 15;270(37):21975-83. Activation of the translational suppressor 4E-BP1 following infection with encephalomyocarditis virus and poliovirus. Gingras AC, Svitkin Y, Belsham GJ, Pause A, Sonenberg N.
Proc Natl Acad Sci U S A. 1996 May 28;93(11):5578-83. Phosphorylation state of the cap-binding protein eIF4E during viral infection. Kleijn M, Vrins CL, Voorma HO, Thomas AA. Poly(A) binding protein, C-terminally truncated by the hepatitis A virus proteinase 3C, inhibits viral translation. Zhang B, Morace G, Gauss-M?ller V, Kusov Y.
Kerekatte V, Keiper BD, Badorff C, Cai A, Knowlton KU, Rhoads RE. Virology. 2008 Aug 15;378(1):118-22. Epub 2008 Jun 24. Cleavage of eukaryotic translation initiation factor 4GII within foot-and-mouth disease virus-infected cells: identification of the L-protease cleavage site in vitro. Foot-and-mouth disease virus infection induces proteolytic cleavage of PTB, eIF3a,b, and PABP RNA-binding proteins. Rodriguez Pulido M, Serrano P, Saiz M, Martinez-Salas E.
Calicivirus translation initiation requires an interaction between VPg and eIF 4 E.
Goodfellow I, Chaudhry Y, Gioldasi I, Gerondopoulos A, Natoni A, Labrie L, Lalibert? JF, Roberts L.
Calicivirus 3C-like proteinase inhibits cellular translation by cleavage of poly(A)-binding protein. Kuyumcu-Martinez M, Belliot G, Sosnovtsev SV, Chang KO, Green KY, Lloyd RE. Rotavirus RNA-binding protein NSP3 interacts with eIF4GI and evicts the poly(A) binding protein from eIF4F. Piron M, Vende P, Cohen J, Poncet D.
EMBO J. 1998 Oct 1;17(19):5811-21. Nuclear localization of cytoplasmic poly(A)-binding protein upon rotavirus infection involves the interaction of NSP3 with eIF4G and RoXaN. Harb M, Becker MM, Vitour D, Baron CH, Vende P, Brown SC, Bolte S, Arold ST, Poncet D.
In vitro cleavage of eIF4GI but not eIF4GII by HIV-1 protease and its effects on translation in the rabbit reticulocyte lysate system. J Mol Biol. 2002 Apr 19;318(1):9-20. HIV protease cleaves poly(A)-binding protein. Alvarez E, Castell? A, Men?ndez-Arias L, Carrasco L.
Biochem J. 2006 Jun 1;396(2):219-26. HIV- 1 protease inhibits Cap- and poly(A)-dependent translation upon eIF4GI and PABP cleavage. Castell? A, Franco D, Moral-L?pez P, Berlanga JJ, Alvarez E, Wimmer E, Carrasco L.
PLoS One. 2009 Nov 24;4(11):e7997. The eukaryotic translation initiation factor 4GI is cleaved by different retroviral proteases. Alvarez E, Men?ndez-Arias L, Carrasco L.
Rubella virus capsid protein interacts with poly(a)-binding protein and inhibits translation. Ilkow CS, Mancinelli V, Beatch MD, Hobman TC. Translational resistance of late alphavirus mRNA to eIF2alpha phosphorylation: a strategy to overcome the antiviral effect of protein kinase PKR. Ventoso I, Sanz MA, Molina S, Berlanga JJ, Carrasco L, Esteban M.
Genes Dev. 2006 Jan 1;20(1):87-100. Diversity in viral anti-PKR mechanisms: a remarkable case of evolutionary convergence. Domingo-Gil E, Toribio R, N?jera JL, Esteban M, Ventoso I.
PLoS One. 2011 Feb 2;6(2):e16711. Vesicular stomatitis virus infection alters the eIF4F translation initiation complex and causes dephosphorylation of the eIF4E binding protein 4E-BP1. Modification of eukaryotic initiation factor 4F during infection by influenza virus. Influenza virus polymerase confers independence of the cellular cap-binding factor eIF4E for viral mRNA translation. Y?ng?ez E, Rodriguez P, Goodfellow I, Nieto A. Effects of simian virus 40 large and small tumor antigens on mammalian target of rapamycin signaling: small tumor antigen mediates hypophosphorylation of eIF4E-binding protein 1 late in infection. Yu Y, Kudchodkar SB, Alwine JC. 19S late mRNAs of simian virus 40 have an internal ribosome entry site upstream of the virion structural protein 3 coding sequence. Structural basis for competitive inhibition of eIF4G-Mnk1 interaction by the adenovirus 100-kilodalton protein. Cuesta R, Xi Q, Schneider RJ. Manipulation of the host translation initiation complex eIF4F by DNA viruses. Biochem Soc Trans. 2010 Dec;38(6):1511-6. Review. Severe acute respiratory syndrome coronavirus protein nsp1 is a novel eukaryotic translation inhibitor that represses multiple steps of translation initiation. Suppression of host gene expression by nsp1 proteins of group 2 bat coronaviruses. Alphacoronavirus transmissible gastroenteritis virus nsp1 protein suppresses protein translation in mammalian cells and in cell-free HeLa cell extracts but not in rabbit reticulocyte lysate. Mutational analysis of the EMCV 2A protein identifies a nuclear localization signal and an eIF4E binding site.